Roweb believes in supporting young talent, and therefore wishes to extend to students the opportunity to intern at our company during this summer. The internship programs focus on three technologies – .NET, PHP and Android – and, at the end of the program, the most talented interns will have the possibility to become full-time Roweb employees. This internship could be the start of a successful career in software development for them, as nine out of ten current Roweb employees started their career here during college. This program has been a success in previous years: we were highly impressed by the students’ interest in the past and this year we’ve already received over 30 applications, from students in the first, second and third years at the Faculty of Mathematics and Computer Science as well as the Faculty of Electronics, Communications and Computers. During their internship, the students will be welcomed into our friendly and relaxed working environment and they will be encouraged, challenged and supported to achieve their best. They will be working with our friendly and enthusiastic senior developers and will benefit of their experience and knowledge transfer. Since hands-on experience is vital for aspiring programmers, the opportunity to put the knowledge that they’ve acquired in college into practice will be of great benefit to our interns. Not only will they gain professional experience, but also in-depth training from specialists that have earned a great reputation for expertise in the latest technologies and best work practices. At the end of the program, all participants will receive an internship completion certificate. 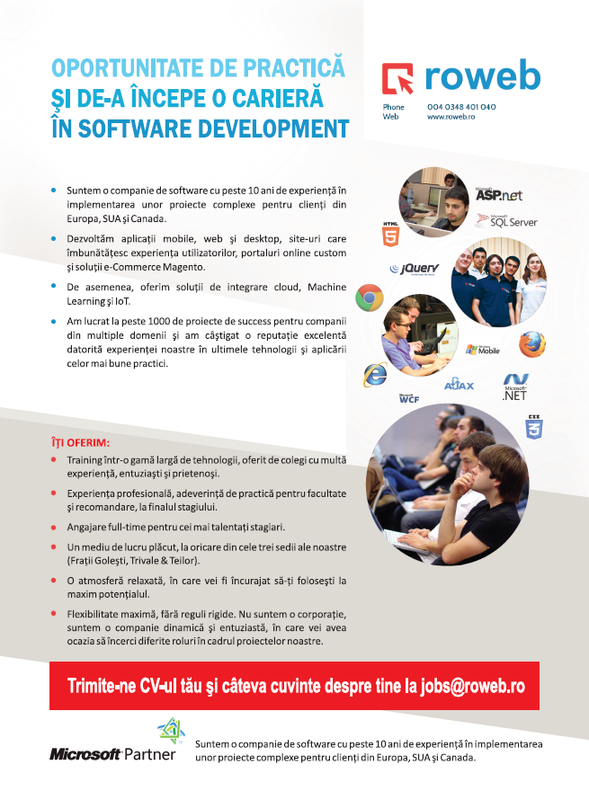 The program starts on the 6th of July – up until then, students can still submit their applications via email, at jobs@roweb.ro.